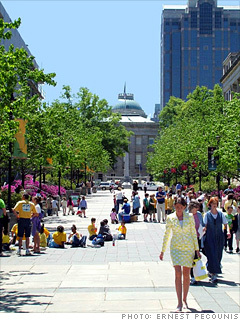 Named for Sir Walter Raleigh, who popularized tobacco use, the city's economic stability once depended heavily on the crop -- and the nation's love affair with cigarettes. But these days, Raleigh is relying on much more intellectual pursuits. Part of the Research Triangle, which also includes the cities of Durham and Chapel Hill, Raleigh is now home to many tech firms, including Red Hat, the open source software company, and Etix, a web-based ticketing company for sports, entertainment and travel. With several prestigious universities in the area, including Duke University, the University of North Carolina and North Carolina State, there are plenty of new recruits for these companies to choose from. Not only do many of the students stay after graduation, but many of their parents have come to live there as well. "The parents have gotten a chance to see the area and some choose to retire here," said Marvin Butler, chair of the Raleigh Planning Commission. Each of these towns offers amenities galore for the post-work crowd -- plus a cost of living that's pretty darn sweet.